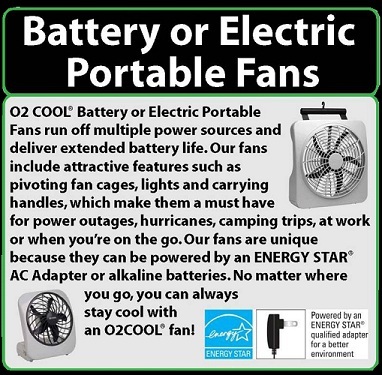 O2 Cool's 5 inch battery operated portable clip fan is perfect for indoor and outdoor activities, use in a hot office or school, for camping, on a picnic and especially during a power outage. 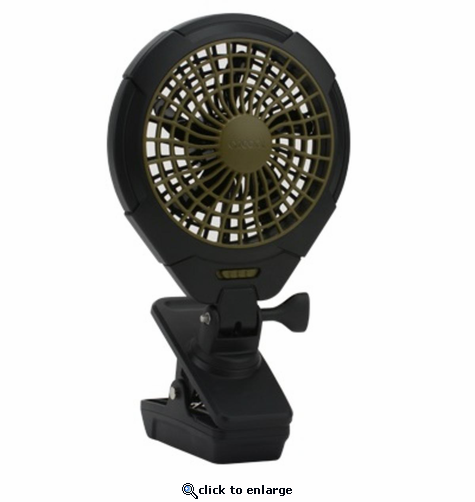 Convenient built-in clip with pivoting fan. Clip allows versatile placement by clipping fan to any stable surface up to 1.5\xEE thick. Perfect for office, home and camping. Uses 4 AA-Cell batteries (not included). O2 Cool\xCDs fans include a range of sizes, multiple power source options, patented fan blades for efficient operation and compact designs that allow you to take the cool anywhere you want to go. I was very happy with this purchase and wish I had bought one sooner. Might be buying another one too. ProsNice output of air and the right amount of "white noise" for me. I purchased it for a trip I'm taking where we will be in a camp setting.